Collagen powder is finding its way into everything from cookies to smoothies, but is it worth it? It wasn't long ago that collagen was something we only thought of when shopping for anti-aging treatments. Today, Instagram is flooded with #collagenpowder which has found its way into everything from cookies to smoothies. Is collagen something we should actually be ingesting? Turns out, yes! And it's not as unappetizing as it sounds. 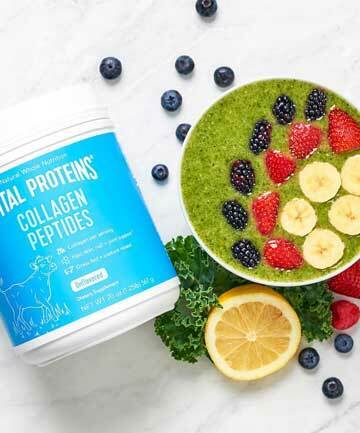 Collagen is the body's most abundant form of protein and one of the most vital proteins your body needs to function (hence the popular Vital Proteins brand that dominates the collagen powder space). "Collagen is the glue that holds your body together," says Janine Whiteson, RD. "It's found in the bones and connective tissue and it helps give structure to our hair, skin, nails, bones, ligaments and tendons. We're able to move around, bend and stretch because of collagen and it helps keep our hair shiny, our nails strong and our skin supple and glowing." Unfortunately, collagen not only starts to decline with age, but also with exposure to environmental aggressors like UV rays, which explains why skin tends to be less firm and radiant as we age. SEE NEXT PAGE: Can a sprinkle of collagen powder really help?